Applications typically provide ways for expert users to increase their performance, such as keyboard shortcuts or customization, but these facilities are frequently ignored. To help address this problem, we introduce skillometers – lightweight displays that visualize the benefits available through practicing, adopting a better technique, or switching to a faster mode of interaction. We present a general framework for skillometer design, then discuss the design and implementation of a real-world skillometer intended to increase hotkey use. 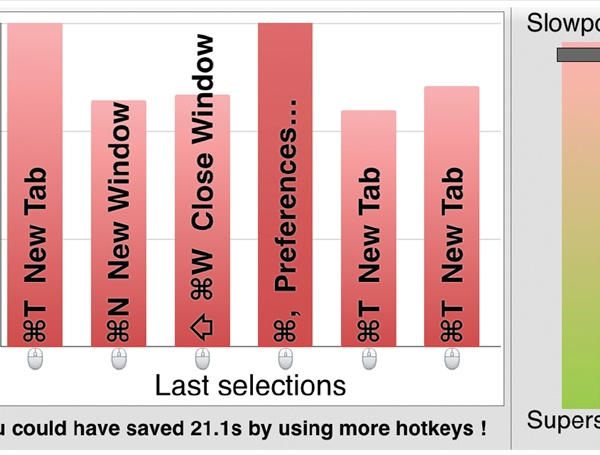 A controlled experiment shows that our skillometer successfully encourages earlier and faster learning of hotkeys. Finally, we discuss general lessons for future development and deployment of skillometers.